HOMESTEAD GARDEN CARTS TAKE THE LOAD OFF YOU! Homestead garden carts are designed for years of gardening pleasure. 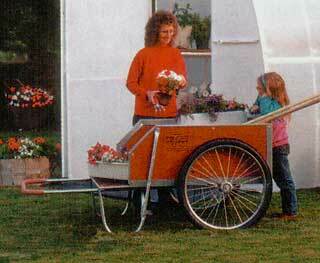 Haul big loads in a Homestead Garden Cart large capacity, heavy duty box. The box is made from exterior grade plywood treated with mildew resistant, oil-based stain to resist weathering. A standard front lift gate makes unloading fast and easy. Galvanized steel U-channel framing protects box edges and adds stability and strength. Steel leg supports are set back, away from feet and legs. The extended tubular steel handle is positioned for maximum leverage. Heavy loads lift, push, and pull easily. The insulating super-grip, reinforced handle cover is comfortable in hot or cold weather. Use to clean stalls, haul tack, and do barnyard chores. The standard lift gate makes unloading mulch or corn-post fast and easy. Ranchers take our carts to stock shows and fairs. Contractors use them on work sites. Retailers move inventory. Hunters haul camping supplies and game. Fishermen use the Homestead to haul light boats over rough trails. Boaters move supplies over docks. 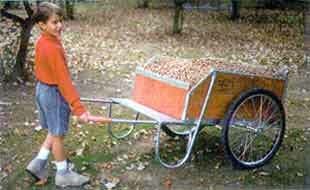 Woodcutters use as a firewood hauler and carrier. Balance and big wheels let the homestead roll over sticks and rocks with ease. The 400 lb. 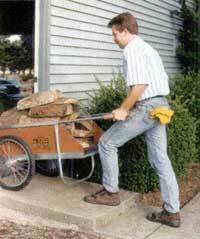 load capacity means you can move a cord of wood in just 8 trips! The Homestead easily moves over 300 lbs. of hazelnuts! Protect the Homestead floor from scratches and nicks with a steel bed liner. Haul a fuller load with a removable rear end gate. Choose the Homestead that fits your needs. ASSEMBLY AND MATERIAL: You will receive your cart in two boxes. The trim and bottom plate are shipped in place on the cart. 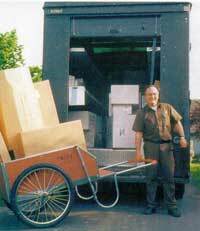 After unpacking, you must mount axle, wheels, sides, leg support and leg, corner braces and handle. Our experienced assembler can assemble a cart in 20 minutes, so it may take an hour or more for the first time assembly. Plywood is treaded & stained. All carts use standard 3/4" diameter axle. 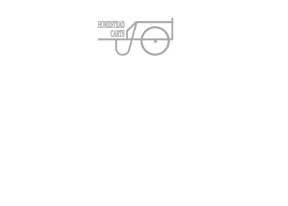 Both size cart wheels have heavy duty 32 spokes and replaceable pressed bearings. Axle drilled for carter pin. Bed liner is 24 gauge, upper trim is 22 gauge, rails & frame is 20 gauge sheet metal. LOAD CAPACITY: 300 lbs., VOLUME: 5.8 cu. ft., INSIDE BOX DIMENSIONS: 20.5" wide X 41" long X 12" deep, OVERALL DIMENSIONS: 28.5" wide X 54" long X 12." high, FULL AXLE WIDTH: 28.5", WHEEL DIAMETER: 20", FULL WHEEL HUB is 4 -7/8" wide. All standard carts come with one front slide open door. LOAD CAPACITY: 400 lbs., VOLUME: 13.6 cu. ft., INSIDE BOX DIMENSIONS: 31" wide X 47.5" long X 16" deep, OVERALL DIMENSIONS: 42.5" wide X 66" long X 32.5" high, FULL AXLE WIDTH: 42.5", WHEEL DIAMETER: 26", FULL WHEEL HUB is 4 -7/8" wide. All standard carts come with one front slide open door.